The most important thing when buying a dress shirt is getting the proper fit and right size. At Ella Hopfeldt, we offer four carefully designed women’s dress shirt fits to help every customer find an ideal match for their body type: Italian fit, German fit, French fit and Spanish fit. To find your perfect fit and size from our collection of women’s fitted shirts, please take our short test and answer two questions. 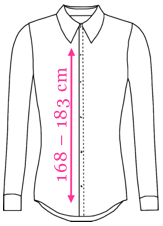 Italian fit shirts are fitted, long length shirts for average height and taller women (166–183 cm / 5’5”–6’0”). Milan: Italian fit, Italian collar, single universal cuff to be worn with either regular buttons or cufflinks. 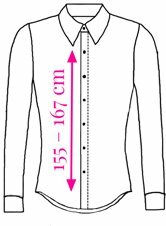 German fit shirts are fitted, long length shirts for average height and taller women (168–183 cm / 5’6”–6’0”). Compared to the Italian fit, the German fit shirts have more room for shoulders and bust and a well-defined waistline. Bonn: German fit, Italian collar, single universal cuff to be worn with either regular buttons or cufflinks. PS! If you are somewhat “in between” body types, both fits may suit you. 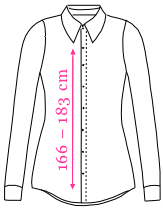 French fit shirts are fitted, long length shirts for average height and shorter women (155–166 cm / 5’1”–5’5”). In general, the fit is identical to the Italian fit, except for the overall length and the length of the sleeves. Nice: French fit, Italian collar, single universal cuff to be worn with either regular buttons or cufflinks. 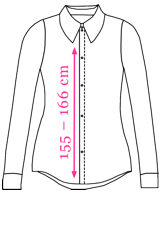 Spanish fit shirts are fitted, long lenght shirts for average height and shorter women (155–167 cm / 5’1”–5’5”). Compared to the French fit, the Spanish fit shirts have more room for shoulders and bust and a well-defined waistline. Seville: Spanish fit, Italian collar, single universal cuff to be worn with either regular buttons or cufflinks. In order to pick out the perfect size for you from our collection of women’s fitted shirts, please measure yourself. The important measurements are bust, waist and hips. Bust: wrap the tape under your arms around the fullest part of your bust. Preferably wearing a bra. Waist: measure around your natural waistline, halfway between your waist and hip. Hip: standing with your heels together, measure around the fullest part of your hips. Now compare your measurements with our size charts and see which size fits you best.